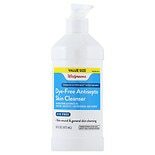 Shop Walgreens Antiseptic Skin Cleanser 4% (16 oz. )16 oz. If you're recovering from a wound, our selection of surgical wound treatments can help you heal. Wound management may require a few steps for proper care. You may need hydrogel to provide moisture or surgical sponges to clean or absorb exudate. Be sure to purchase your doctor-recommended wound dressing to ensure a safe environment for the surgical site. Shop our selection of surgical wound treatments from dynarex, Medline and AQUACEL. Providing the proper environment for your surgical site can help speed you recovery. Among our selection of surgical wound treatments, the wound bandage can be an important part of the healing process. You may need a surgical wound dressing that provides a moist environment, or one that is highly absorbent to keep fluids away from the wound. There are even transparent dressings, so you can monitor how your wound is healing without having to remove the dressing. Depending on the type of surgery you've had, our home medical department may have a number of helpful, useful products to ease your recovery. If your surgery has hampered your mobility, we have a broad selection of mobility assistance products to make daily living easier. We carry everything from commodes and bath safety bars to scooters and lift chairs. We also stock canes, walkers, rollators and crutches to help you get around. Shop our home health care products for medical nutrition, more aids to daily living and patient care items.